Linking up with Emily for 31 Days of Blogging. 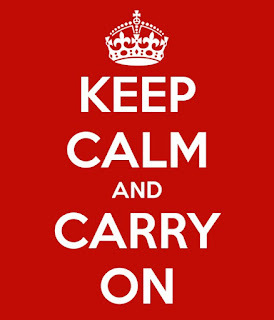 My favorite Quote is Keep Calm and Carry on. It's the British slogan from World War II. Due to various reasons (I sometimes lead a very stressful life due to family and work obligations), I tend to get quite upset and stressed over things. My dear friend, CBM, introduced me to this saying when I once got so upset that I started to cry uncontrollably. It since has become my motto. Keep Calm and Carry on...Tomorrow is another day. i love that quote! and i think it's very applicable to the holiday season! sometimes things can get very overwhelming during the holidays!! merry christmas sweetie :)!